Changing wheels is unquestionably the quickest way to transform the look and feel of whatever you drive. It doesn’t matter if you’re in it purely for aesthetics or for the performance benefits realized with better tires, its wise to understand everything that goes along with this most common of modifications. Think buying a new set of wheels is like going out for a loaf of bread? WRONG. Hey, don’t roll your eyes at me. That’s why RightFootDown has put together this guide to help you digest all of the strange lingo and words that may get flung about as you talk or research wheels and tires. The content you are about to see was copied in its entirety from RightFootDown.com for the mass viewership offered by the Oppo community on Jalopnik. We understand how many people feel about clicking links to 3rd party sites. Truth is, we need you to continue producing content like this. This is the size of the wheel measured from top to bottom, or end to opposite end of the face. The face being the part of the wheel everyone sees from the side of the car. This is often called the wheel face. Wheel diameter of modern cars tend to range from 17″ to 22″, depending on the make and model. Smaller, lighter cars, tend to have smaller diameter wheels while larger vehicles tend to have larger wheels to help fill the fender wells. A wheel’s inward or outward position under the fender is measured by the offset. If a wheel is 8 inches wide, and the point at which the wheel bolts to the hub is exactly 4 inches in from the face (being dead center of the wheel), then it is said to have a zero offset. This would be displayed as ET0 when reading the wheel specifications and that value should be stamped on the back side of the wheel. If a wheel needs to be pushed outward toward the fender lip for better fitment, a smaller offset would be required. If the wheel sticks out of the fender and needs to be pulled inward, an higher offset is required. Offset values can be positive or negative, though most often they are positive. Be mindful when purchasing aftermarket wheels. Choosing a wheel with incorrect offset can result in a wheel being pushed too far in or out. Wheels with too much positive offset can be made to fit with wheel spacers. Wheel spacers are blocks of metal that sit between the wheel and the hub in order to push the wheel further outward, decreasing the offset. On the E46 M3, the front wheel is 8.5″ wide with an ET27 offset. It is common practice to install 12mm spacers to push the wheels outward to sit more flush with the fender. This spacer effectively produces a offset ET15. E.G. 27mm-12mm = 15mm. Volk Racing wheel tightly centered via the hub. The hub is a circular shaped lip protruding from the center of the brake rotor. It is used to center the brake rotor as well as center the wheel. Noting the hub size is important. If the hub size is 56mm in diameter, a wheel must have a 56mm hub bore in order to fit over it. Many universal fitment wheels have large hub bores to accommodate most hub sizes. While it may sound good, this means the wheel may not sit centered to the hub when bolted on. Hubcentric rings, or centering rings, may be included with wheels to reduce the hub bore size to create proper fitment. For example, the BMW E36 3-series has a 72.5mm hub and the BMW E39 5-series has a 74.1mm. This means that wheels from the E36 will not physically fit on the E39 because the hub bore is not large enough. To fit the E39, the hub bore would need to be enlarged. The good news is that E39 wheels will fit the E36 as the hub bore is larger, but ideally should be fitted with hub rings to ensure proper centering. A wheel is mounted by slipping it over the hub and lining up the studs with the holes in the wheel and then twisting on the lug nut. Unless you drive a BMW, that is. Then you have wheel bolts, and have to balance the wheel on the hub, hoping it doesn’t fall on you, while reaching for the studs to push through and begin threading on. Fun. Lug nuts come in different shapes and sizes, like 17mm, 19mm, 5/8″, etc. As long as the thread pitch is correct, it’ll screw on. But what you want to be mindful of is the lug seat pattern that the wheel is designed to accept. The term “lug centric” isn’t often used, but what it means is that the wheel nuts or lugs are used to center the wheel. It does so by matching the seat shape with the lug shape to keep them snug and prevent the wheel stud from sliding around the stud hole in the wheel, which is a bit larger. The wheel may have a conical, ball or flat seat for the lug nut. So long as the lug nuts used match the seat design of the wheel and are torqued down properly, the wheel should be centered on the hub. Many wheels are both hubcentric and use conical, ball or flat seats to ensure a precisely centered wheel fitment. Not to be overlooked, the construction of a wheel directly impacts it’s strength. Wheels with low quality construction could result in severely damage, such as cracking (or worse), whereas a wheel with high quality construction may result in minor scathing, or limited damage. The most common types of wheel construction are forged, cast, and flow-formed. Forged wheels are produced by taking a large piece of aluminum, then cutting and shaping similar to how clay pots are formed on a pottery wheel. Because of the strength of the aluminum blocks, more material can be removed from the wheel to decreasing weight without sacrificing rigidity. Forged wheels cost more due to the cost of materials, equipment, and manufacturing time. Most manufacturers of competition and high-end wheels used the forged process. Rays Wheels produces the Volk Racing TE37, a legendary wheel in the auto racing world, and is known for it’s classic design, strength and most of all – lightness. To demonstrate the difference of wheel weight based on the manufacturing process, I’ll provide several examples of wheels that are regarded as top of the line. And all in a similar size. To start, a forged 18×10 TE37 wheel weighs in at 19.0 lbs. Cast wheels are produced by melting aluminum into a mold. The wheels are cooled, cleaned, painted and then distributed to retailers for sale. This process does little to enhances the tensile strength or rigidity of the wheel. Cast wheels are known as the heaviest type of wheel and the most brittle. There is gravity casting, which is when material flows into a cast on it’s own. And then there is low pressure casting, where the material is pushed into the mold with positive pressure. The latter is the most common way to produce wheels as it doesn’t cost substantially more than gravity casting, but the end result is a wheel that is measurably stronger and lighter. Cast wheels are the cheapest to purchase. We can not recommend gravity cast wheels for any vehicle that sees competition use, nor would I recommend them for a street car. A popular aftermarket wheel manufacturer is Rota. Their ‘Grid’ wheel features a design similar to the Volk Racing TE37. The 18×10 Rota Grid weighs 23 lbs. Flow formed wheels are produced using a casting process to produce the wheel face, however the wheel is spun quickly and at high temperature while pressure is applied to the inner and outer portion of the wheel barrel and then compressed and elongated, stretching the aluminum. 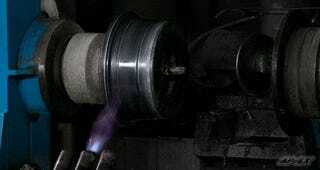 The result is similar to the forging process, but only on the barrel portion of the wheel. Flow formed wheels are much lighter and stronger than cast wheels as the aluminum on the barrel and lip. This means the wheel is more resistant to shocks and also have greater load capacity than cast wheels. We’re cool with flow formed wheels and they are often used in race applications. Apex Race Parts, as the name implies, produces budget friendly wheels for racing applications. Their 18×10, flow formed, ARC-8 wheel weighs just 19.9 lbs. Not to further complicate things, but wheels aren’t always created from a single piece of material. Those that are, are referred to as 1-piece wheels, as they can not be taken apart. It’s all or nothing. The barrel and face can not be separated without damaging the wheel. A 2-piece wheel, as the name implies, is a wheel that is formed by joining two separate pieces. Those two pieces are the face and the barrel, and they are held together tightly with bolts and sealed with a gasket or silicon to ensure there are no leaks. 3-piece wheels take it a step further. There is an inner barrel, outer barrel (with the front facing lip), and the face. With these three pieces removable and interchangeable, unlimited offsets and wheel specifications can be created. It is possible to take a wheel face with a design you like, and replace the barrels in order to “step-up” to a larger wheel diameter. Each component in the wheel can be customized with different finishes to create truly one-of-a-kind designs tailored specifically to your needs. There is a lot of money that can be saved by purchasing used wheels. There are also a few things to look out for. Roll the wheel on a smooth surface and look for bends. You want true wheels without any wobbling. Minor bends can be fixed and sometimes make no impact on balancing out or real-world drive-ability. Most bends can be fixed by a reputable wheel repair shop. Cracks are a good indicator that the owner hit something hard. It could have been a curb, a pothole or road debris. Depending on the wheel construction and severity of the crack, it might be salvageable by a reputable wheel repair shop. Rates vary, but plan on spending $200 per wheel for damage correction and truing. Reading tire size isn’t so difficult. First, it’s clearly marked on the side of all street tires. The format is width/sidewall aspect ratio/wheel diameter. As an example, a 245/45/17 stamping indicates the tire width is 245mm, has a sidewall height that is 45% of the advertised width, and fits a 17″ wheel. Using this, we can calculate the sidewall height as being 45% of 245mm, or 110mm. That’s 4.3″ when converted from millimeters. Finally, multiply the sidewall height by 2 and add the wheel diameter to get the tire height – 25.6″. Truth be told, I like to use the TireSize.com calculator, which allows me to see direct comparisons of different sized tires. If up-sizing a wheel diameter and retaining the same tire width, the general rule of thumb is to decrease sidewall aspect ratio one size for each inch increased of wheel diameter. Common tire aspect ratios range between 30 and 70. The lower the aspect ratio, the smaller the sidewall. An extremely low aspect ratio on a large diameter wheel gives that Hot Wheels rubber-band look but doesn’t provide much sidewall flex and will not absorb road imperfections as well as a tire with a taller sidewall. Let’s look at a 245/40/18 tire. Doing the math, it is 25.7″ tall. If this was the widest tire that we could fit under our car’s fender but wanted to increase the wheel diameter to 19″, reducing the sidewall aspect ratio to 35 results in a very similar in tire height at 25.8″ tall. Only a tenth of an inch taller and would be a near perfect tire size for the new 19″ wheel. If reducing the wheel diameter to a 17″, perhaps for weight savings and cost of tires for competition, we would increase the sidewall aspect ratio from 40 to 45, and calculate the tire height to confirm we’re in the right ballpark. Downsizing from a 18″ wheel with a 245/40/18 tire to 17″ wheel with a larger 45-series sidewall’ed 245/45/17 tire has an identical height. Perfect fit. Tire manufacturers should provide recommended wheel widths to aid fitment. A 245/40/18 is 245mm wide and provides a rather square fitment on a 8″ to 8.5″ wide wheel. Fitting to a wider wheel with begin to stretch the sidewall, which helps reduce deflection and increase steering response. Don’t go crazy with sidewall stretching, though. While tires can be fitted to wheels beyond the recommended width, they have a greater chance of becoming unseated from the bead and causing damage. If choosing wider wheels to increase traction with wider tires. As an example, the E92 M3 rolls off the assembly line with 9.5″ wide rear wheels and 265/40/18 tires, 26.3″ tall. Looking at wider tire options, a 295/35/18 tire is 26.1″ tall so the sidewall will appear near identical but the tire will have 60mm more rubber meeting the road. Up-sizing to a 19″ wheel with a 305/30/19 tire would be 26.3″ tall, offering 80mm of additional rubber on the road. Those of you with performance in mind may want to consider tire weight. Not all tires of the same size result in the same number on the scales. That extra 2 or 3 pound difference will be mounted on the outer most part, which has most impact. The difference in tire weight could potentially negate weight savings found from those gorgeous new forged wheels. Or it may mean spending more money on lighter wheels to come out ahead of the factory setup. PRO TIP: Did you know tires aren’t balanced? New tires often include a stamp of yellow or red paint on the sidewall. These marks should be lined up with the valve stem or tire pressure sensor on the wheel for optimum tire balancing. Doing so helps reduce the amount of weight required to balance the wheel and tire after mounting. When exposed to the elements, those paint marks wear off. If removing tires that you plan to re-use, it’s a smart idea to mark the sidewall closest to the valve stem before removal. This can help reduce the amount of tire weight needed when re-mounting the tires in the future. This rating is to indicate the speed a tire can safely sustain for a period of time. If you know nothing of tires, chances are you’ve heard of Z-rated tires and probably associate them with high performance. Truth is, the Z rating is only for 149+ sustained MPH. W and Y rated tires are rated at 168 and 186 MPH. Most sport sedans and sport coupes are equipped with H rated (130 MPH) or better tires, including V rated (up to 149 MPH). In short, a Z rated tire shouldn’t fail at speeds under 150 MPH. Tread Wear and UTQG What? The rate at which the tread on the tire wears, along with temperature and traction ratings are displayed as part of a UTQG (Uniform Tire Quality Grade) value and testing is not performed by the Department of Transportation. Testing is performed by independent companies hired by the tire manufacturer and the rating on the tires may be conservative or optimistic. A 200 tread wear tire from Bridgestone may wear substantially quicker or possibly last longer than a tire with the same rating from, say Michelin. The UTQG rating is comprised of 3 values. The tread wear, traction and temperature rating. The temperature rating is how well the tire resists the destructive build-up of heat. A rating of ‘A’ is the best while ‘C’ is the lowest. From TireRack, “The traction rating is based on the tire’s straight line wet coefficient of traction as the tire skids across the specified test surfaces. The UTQG traction test does not evaluate dry braking, dry cornering, wet cornering, or high speed hydroplaning resistance.” But let’s be honest, the tread wear is what we all look at. The higher the UTQG numeric value, the longer the tire life, supposedly. It’s like this: A 200 tread wear rated tire should last twice as long as a 100 rated tire. A 300 rated tire should last three times as long as the 100 aged tire. Of course, it’s most accurate when comparing tires of the same brand. For real-world example, Michelin’s Pilot Super Sport has a 300 AA A UTQG rating should last 33% longer than the 200 rated Pilot Sport 2. Sometimes a tire manufacturer will offer a mileage warranty on their tires to give consumers an idea of how long the tire should last under normal driving conditions. The Michelin Pilot Super Sport, arguably the best performance street tire currently in production, carries at 30,000 mile tread life warranty. But only for vehicles with the same size tires on all axles so they tires can be rotated. If the tires cannot be rotated, it’s a 15,000 mile warranty. The age of a tire is a thing. Like most consumable goods, tires too have an expiration. Though not directly stamped as an expiration, the production date is stamped on the sidewall of the tire and it is advised that tires only be used for up to 5 years after their production date. Purchasing used tires can be risky. While tread depth is important, the age of the tire and it’s history are equal. Ask yourself, how old is the tire and how long do I plan to use it? If buying a tire nearing 4 years old, I’d be sure it’s in very good condition and that I’d be replacing it soon. An example would be if I had a blow-out and need a tire in a pinch until I can get home to order new ones that match the rest. Does the tire have any patches from nails, or damage such as torn sidewall? While a patch or two near the center of the tire tread is usually okay, patches nearing the sidewall are a red flag. The tire’s sidewall flexes and you don’t want a patch job flexing. If the sidewall of the tire has any tears or damage, do not buy them. If the tire shows it’s age in the form of dry rot, walk away. This is an indicator that they are old or were not stored properly after removal. You don’t want those, either. Now that you’re an expert on wheels and tires, put that knowledge to good use! Go get some sweet wheels under your ride. Or when your friends or family are in the market for wheels or new tires, help them out! If you enjoyed this RighFootDown article or have any feedback to make it better, please leave us a comment.